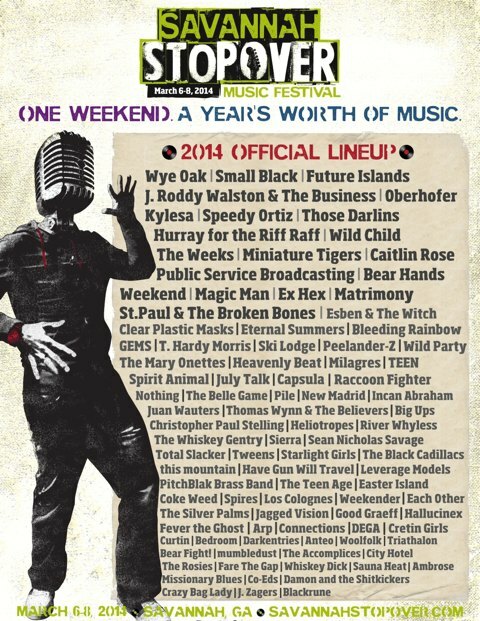 On the Way to SXSW is Savannah Stopover Festival. Bushwick Will Represent! We all know that Brooklyn has the greatest music scene in the country (potentially the world, but let’s not toot our own horns over here). In Bushwick, we’re pretty spoiled; all the latest and greatest new bands, both local and touring, are never more than a few subway stops from our reach. This March, Brooklyn heads south for the Savannah Stopover Festival, a small gathering festival conveniently located on the way to SXSW in Austin. From March 6-8, the beautiful and historic city of Savannah, Georgia will host many of our favorite hometown heroes, plus some of the fastest-rising buzz bands from all across the country. Read on for a Savannah Stopover playlist, featuring Brooklyn's finest. The spectacular lineup includes headliners like Future Islands, Speedy Ortiz, Those Darlins, and Oberhofer. As far as Brooklyn is concerned, lucky festival-goers can look forward to catching TEEN, Ski Lodge, Raccoon Fighter, Big Ups, Juan Wauters (of the Beets), Total Slacker, The Teen Age, Heliotropes, Heavenly Beat, Small Black, and others. Some other faves- like Bleeding Rainbow, Ex Hex, Tweens, Gems, and Pile- will also make appearances at the festival. Although, you pretty much can’t go wrong with any band from this year’s lineup. Check out the poster and prepare to be amazed. So, there you have it; If you enjoy balmy temperatures, historic scenery, scrumptious southern cuisine and, of course, stellar tunes, consider making a stop at this multi-venue, pre- SXSW detour. Tickets are available now, and a three-day pass is a steal at $75. Grab 'em here!